It is our goal to make your stay with us thoroughly enjoyable. From your sleeping bag to our luxury campers. We have everything you could imagine to make your stay with us an amazing adventure. 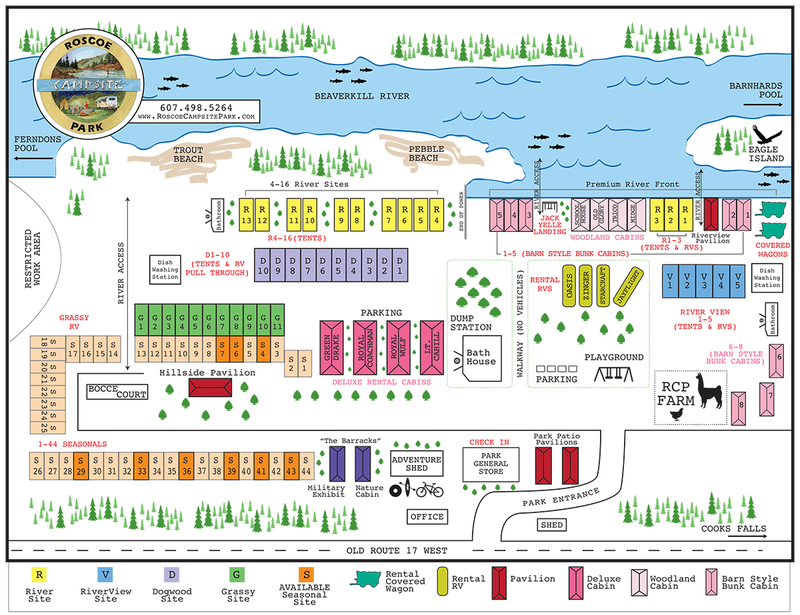 If you forget something, that’s ok. You can stop in our fully stocked general store. Fish our streams, hike our trails, or just picnic riverside. Take a stroll through town, browse the many wonderful shops and enjoy a bite to eat at the wide variety of restaurants. Roscoe Campsite Park has the accommodations to make your stay in the mountains one that you will remember. Guests can choose from various types of accommodations available. They range from a simple tent site, or bunk style cabin to a stay in our luxury cabin and campers. 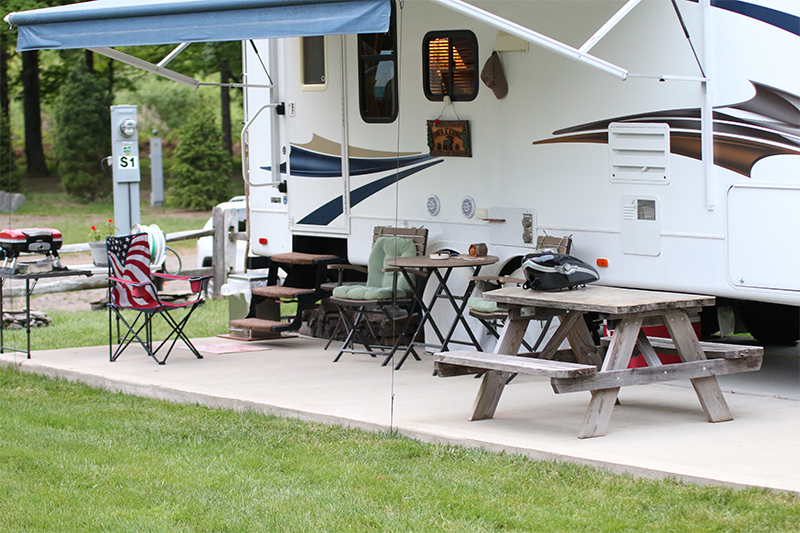 We have spacious sites available for your own RV units. We rent sites by the day, week, month or inquire about becoming a seasonal member of the park. If you are a first time camper or in between RV units, you can inquire about renting a tent or camper. Check-in Time 2:00pm – 10:00pm. Please call 607-498-5264 for check-ins after 10:00pm. Check-out Time 11:00am. Please note that Day Passes are not valid to extend check-out time. A 50% Deposit is required at the time of reservation. Reservations are not held or confirmed until a deposit is received. Deposits may be paid for by cash, check, money order or credit card. Final balances are due 14 days prior to arrival. Reservations made within 14 days of arrival date must be paid for in full at the time of reservation. Due to the nature of our business and the limited amount of space, cancellations or “no shows” do NOT qualify for a refund. However, if you are forced to cancel, we will gladly apply your payment less a 20% handling fee to a future stay within the current year. This of course does not apply to “no shows”. There is a two night minimum stay for weekends during May and June and certain weekends in July and August. When booking a Saturday and Sunday without booking Friday night weekend rates will apply for Sunday. There is a three night minimum stay on holiday weekends. Memorial Day, July 4th, Labor Day and Columbus Day.